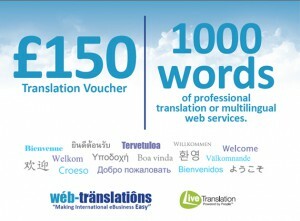 Your voucher entitles you to 1000 words of free translation. This can be used for any purpose, and you can use it on a larger project to reduce the overall cost. Professional proofreading by a second native translator is included. This offer is available for: English into Arabic, Chinese, Czech, Dutch, French, German, Greek, Italian, Japanese, Polish, Portuguese, Russian, Spanish and also into English from any of these languages. Voucher is valid for one language only. Voucher is valid for one business order only. Any credit not spent will then expire. Vouchers are valid until 31 August 2016.